We’ve got big plans for the Christmas Bash this year. We thought it might be fun to do something more than just eat pizza, drink cola and play video games. So we have having some Micro-Talks. Then we are going to eat pizza, drink cola and play video games. If you have done something shiny recently, contributed to a cool project, met someone influential or found a really neat thing everyone should know about then come and tell us all about it. Each speaker will be allowed 5 minutes, and a maximum of 4 PowerPoint slides, to talk about something or other. After this people can ask questions. The idea is to keep things short, sweet and interesting! 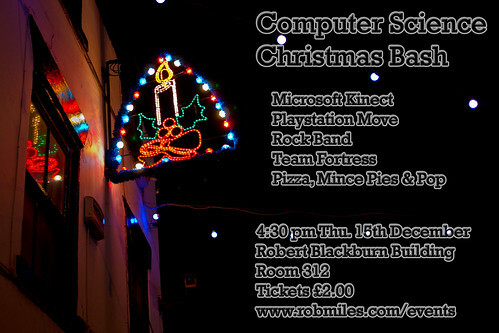 The fun begins on Tuesday 17th December at 5:15 in Robert Blackburn Lecture Theatre C (RB-LTC). Thanks to Danny Brown for setting the talks up and getting hold of the bumper haul of swag we are giving away as prizes. Once the talking is over, the pizza will arrive at around 6:30 and we can eat and head off to play games. We will have all the attractions on the poster above and of course the mega-wordsearch with big prizes that are big. Tickets go on sale at 2:00 pm on Wednesday 11th December in the Departmental Office. The Summer Bash for this year will be on Thursday 30th of May in the usual place, but with a few changes. It will be happening alongside Three Thing Game, which will be happening at the same time, concurrently and in association with it. All of the usual favourites will be in place, including Team Fortress, assorted video games and, for the first time, Board Game Corner. Come along and try your hand at obscure, but fun, games like “Braggart”, “The Resistance”, “Zombie Dice”, and anything else you fancy bringing along to play. Except Monopoly. It all kicks off at 4:30 pm in Room 312, the Open Area and various other nooks and crannies around the department. There will also be a word search, where you can search for words. And pizza, and pop. Entry is by ticket only. Tickets cost 2 pounds each and will be on sale from the Departmental Office in Computer Science from 2:00pm on Wednesday 22nd of May. 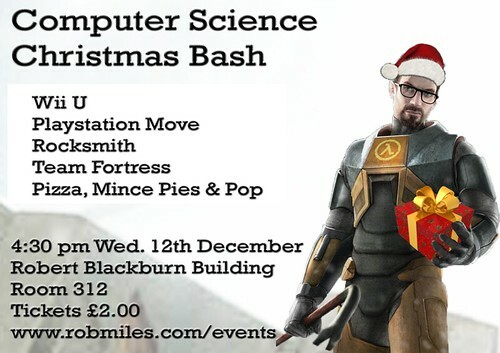 We will be having our Christmas Bash on Wednesday 12th of December in the department. There will be hastily set up video games, food ordered at the last minute, and staff arriving just in time to be beaten at Team Fortress and whatever other gaming goodies that we can find, including a Wii U or two if we can get them to work. In fact, this event is so "thrown together" that we've had to use the artwork from a couple of years ago. But it will be fun for all that. Tickets are available from the departmental office. We had our last bash of the year today. It was great fun, even though we had some technical troubles. The camera on the PlayStation Move was definitely faulty, causing me to lose at Table Tennis. Fortunately the Pizza arrived on time, and everybody had fun. Some were there with tears in their eyes, with this being their last bash as students in the department. 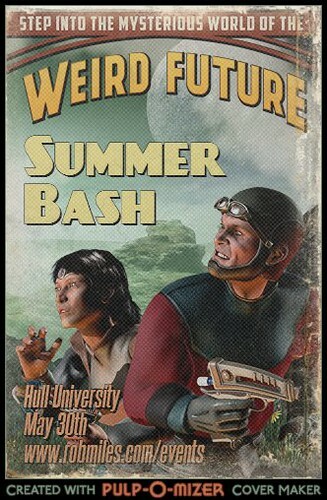 I took some pictures, there are a few more on Flicker tagged Hull2011SummerBash. Thanks to all who came along to the Christmas Bash. I think a good time was had by all. If you want to try and find yourself on the pictures I took you can look here. Black Marble, a software company based in Bradford, holds regular events for developers which are well worth a visit. The next one is on Wed. 22nd October at 6:15 and it is about Silverlight, XNA and Gaming. I will be taking a magic bus to the event, leaving at 4:30 pm. If you want to come along you can register here. I'm sorry, but the trip is now full. In fact we've had more registrations than I have places on the bus I'm afraid. I'll be sending an email to those who have registered later today. The ones that don't make the cut have first pick of the seats at the next event. I'm afraid that the bus is now full. You can use the link to contact me in case of any cancellations, and you can still register for the conference if you have an alternative means of transport. Slide 7 is a development conference aimed at students who want to use the latest technology in their projects. It all happens on the 18th of June at Microsoft UK Headquarters, Thames Valley Park in Reading. You can register for it here. If you want to make use of free transport from Hull to Reading and back (travelling down on the Sunday, staying in luxurious Travelodge accommodation and then rumbling back in the magic minibus on the Monday night) then sign up for transport here. You can book your accommodation (at the moment you can have a room for 15 pounds a night) here. You need to book for the night of 17th of June. We will be travelling back on the 18th, leaving after the BBQ, arriving back in Hull late on Monday night. The day is split into two tracks, introductory and advanced, and the stuff looks good. Take a peek here. Places are strictly limited, so register as soon as you can. XNA Game Studio Express is the next generation of games development platform from Microsoft. If you want to find out more about this, and how you can use it to create games for the XBOX 360 using Visual Studio, I am running a trip to Warwick. I will be driving a minibus down the night before (12th of December) returning on the evening of the 13th. On the night of the 12th I will be staying at the Birmingham Maypole Travelodge, which is shiny new and at time of writing offering double rooms at 26 pounds a night. If you want to come along you must do the following (in this sequence). Contact me to reserve a place on the bus. Reserve a place at the conference. Contact Travelodge to book yourself in at the hotel. 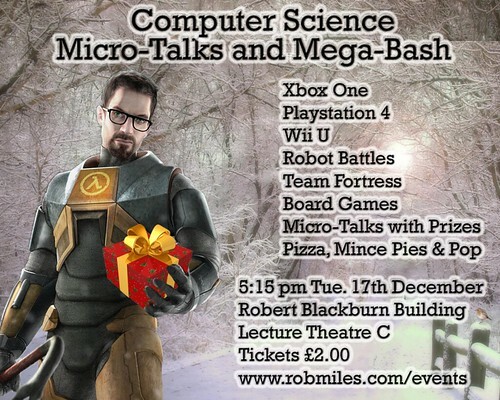 If you have any interest in games programming you really should come along to this event. The spaces in the bus are now pretty much full and I'm finalising arrangements for those who have booked. If you want to be placed on a waiting list for the trip, in case anyone drops out, please get in touch on that basis. I've just been told by Travelodge that the place we are going to stay in will not be ready. We are therefore transferring the bookings to Travelodge Rugby Dunchurch. Everyone who has been in touch with me should have received an email notifying them of this change. The magic bus will be departing from the Venn Building at the front of the univestiy at 5:00 pm on Tuesday. We will stop for tea on the way down and then get to the Travelodge in the evening. We should be back in Hull by around 9:30 or so on Wed. night.